May 15th, 2005 -- A well-dressed gang of four shuffles into The Whistle Stop Bar in South Park and bursts forth with sheer pop goodness; it’s rumored an angel got its wings on that night (you know -- if you believe in that sorta thing)! ... Sound familiar? It was just over five years ago that the four of us graced the stage for the first time together, playing to a packed house of friends and family at the beloved Whistle Stop, and from that day forward, we never looked back. But! were we to look back now, we would now see three albums, four EPs, one SD Music Award for “Best Pop Album," two other nominations, a pear tree, and ourselves in a slightly less haggard state. Yes, we’re starting to smell like a combination of whiskey and grandpa (which, coincidentally, are one in the same). We loved to write the songs, we loved to play the songs, and we hope (know) you loved to hear the songs. But after many years, our train’s pulling up to its last (whistle) stop for the foreseeable future. It is with fond memories and the warmest sentiment that we announce our plans to, come August, take a break from it all. An “indefinite hiatus,” if you will. (For the definition of "indefinite hiatus," please see current status of Sleater Kinney). 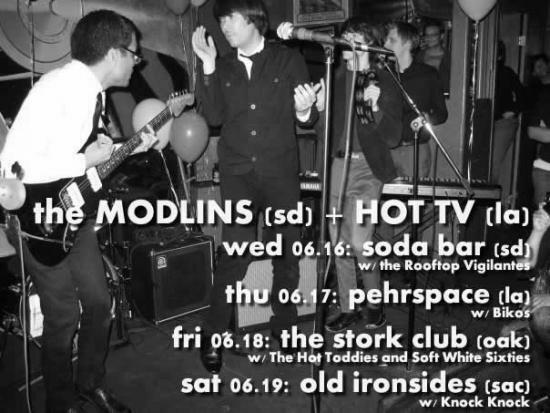 In five years, we have created a ton of music and never taken a break from The Modlins. Even in months when we weren't playing live, we were always writing, practicing, recording, mixing, or all of the above, and it’s time for a rest and, for some of us, a change of scenery. But before we settle down for our long winter's (autumn's) nap -- we're gonna have a few final hurrahs. So, we would like to take this opportunity to announce a few more shows... and a couple more albums. Read on! Final hurrah #1 – One more road trip! Come mid-June, we’ll be heading out for one more tour. Four shows, all in California. Our apologies to the other 48 states (Not you, Alaska. Arizona, you're on thin ice. And Alaska, you're on thick ice.) Get it while it’s hot. And speaking of hot, our producer extraordinaire (aka friend) Mark Bertuldo will be bringing along his band “Hot TV” to play all dates with us, so it should be a ton of fun! They're just great, and we’ll be switching off the Headliner/Opener slot with them. Check it! Sat, Jun 19th @ Old Ironsides in Sacramento. Final Hurrah #2 – Two more albums! ONE NIGHT ONLY! Final Hurrah #3 (How can it be a 3rd final hurrah? That means the first two weren’t really final, were they?) – FAREWELL SHOW!!! And contrary to what hiatuses usually mean, the four of us are actually closer, more collaborative, and more on the same page than ever before -- and we think that this will be demonstrated by our new records, of which we are enormously proud. We think that they contain some of our best material to date, and we hope you'll agree. But, this flurry of productivity makes the break all the more welcomed, and who knows what the future will hold for us musically. But for now, this chapter of the Modlins is coming to a close. So finally, and most importantly, we’d sincerely like to express our gratitude for your support over the course of the last five years. Thank you for coming to our shows, buying our records, giving us a roof over our heads when we weren’t near our own, and generally making us feel like what we did in that time was worth a damn. From the bottom of our maudlin hearts, we appreciate you and hope you make it out to some (or all) of these events so that we can show you just how much you mean to us. PS If someone wants to get us on an awesome label, and feature our songs in an awesome movie or commercial, give us a ton of royalties and just generally get us to "the big time," then awesome! The above all goes out the window in that case! share this post: Facebook | del.icio.us | DiggIt! CD Release Show This Friday 07/02 ! Farewell Tour starts Tomorrow! New Music Video! !